• De 2 regio's ( West- and East Midlands ) zijn hierboven samengevoegd tot één: Midlands. • Klik je op dit nummer 21 in de kaart, dan word je doorverbonden met kader 21 hieronder. • De wandelingen uit de Top 10 (hier: Mam Tor) hebben een oranje nummer gekregen. ......................... ( the next step down from a National Park). 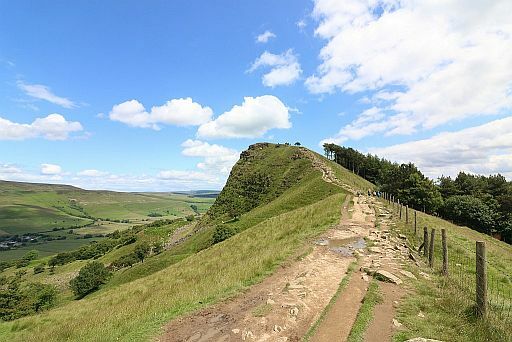 A beautiful and technically simple walk right in the heart of the Peak District, which showcases everything that’s great about Britain’s oldest National Park. Back Tor and Lose Hill. with views stretching from Kinder Scout to Win Hill and Stanage Edge. 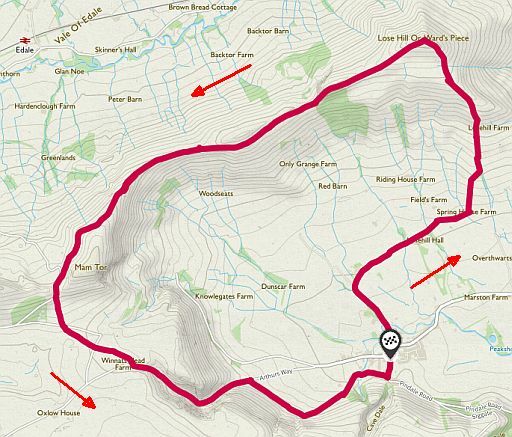 The 517m peak of Mam Tor, which means ‘Mother Hill’, is the standout attraction of the route, with the distinctive landslips on its eastern face delivering spectacular visual appeal. • Start / finish: Castleton. 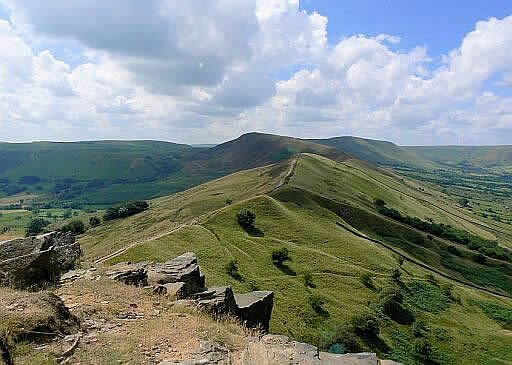 • The ridge walk to Mam Tor. 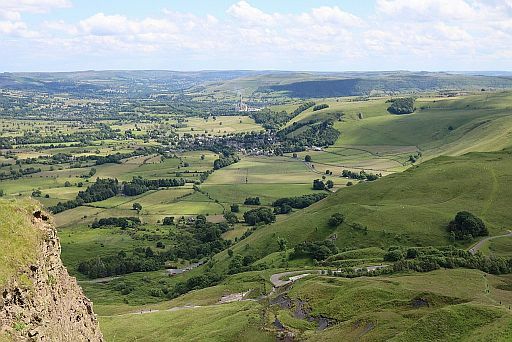 • Looking out over Castleton from the summit of Mam Tor. • Op dit kaartje zijn de vier topjes van de heuvelrug genoemd met hun hoogten. 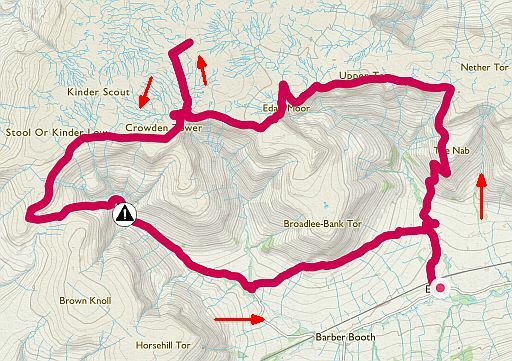 Kinder Scout is an eroded peat plateau in the Dark Peak. known here as edges. ( Edge is de streeknaam voor klif). channels called groughs borderd by banks of peat. 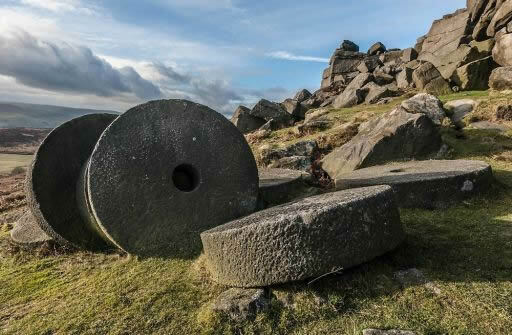 Gritstone (Millstone grit) = A coarse-grained sandstone. ................ Hier maakte men in het verleden molenstenen van. 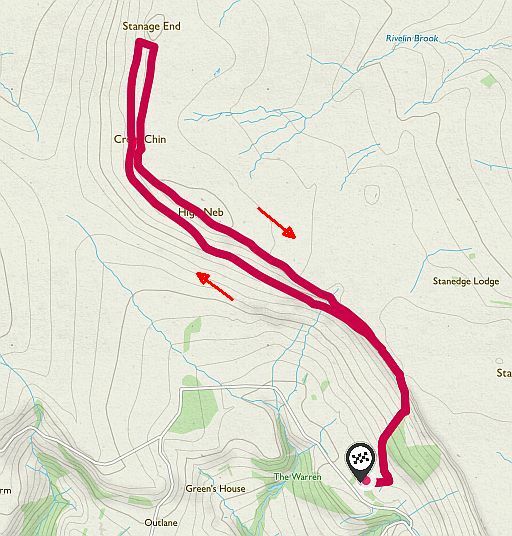 • Start / finish: Edale. 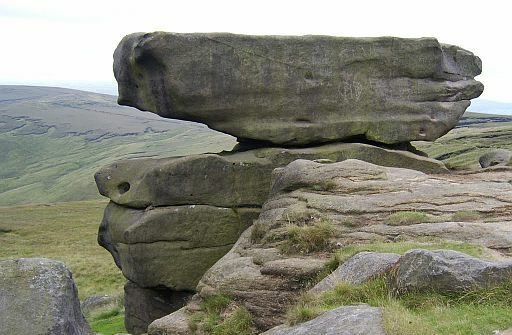 • Noe Stool is a prominent feature on the southern edge of Kinder Scout. • It is a typical, anvil (aambeeld) shaped tor formed from millstone grit. ...(millstone grit is een soort zandsteen, waar men molenstenen van maakte). • Dit gebied is duidelijk upland ( = land lying above the limit of enclosed farmland). .. resembling enormous bales of wool or just about anything else you can imagine. • Gritstone = a coarse-grained sandstone. ..... Hier heb je upland (= land lying above the limit of enclosed farmland). ....van de wandelgids. Zie op blz. 12 de Top-Touren. 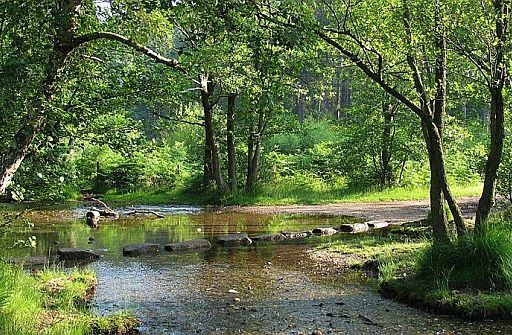 river, ancient woodlands, great wildlife and spectacular rock formations. 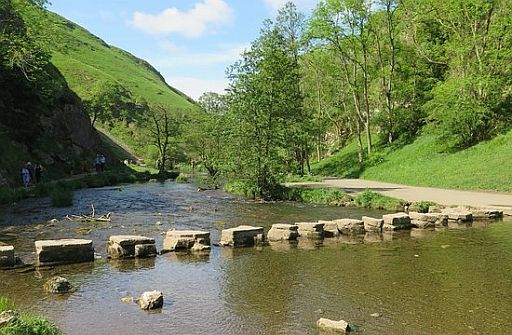 and its famous stepping stones before finishing in the pretty village of Milldale. here because it’s such a beautiful place to walk. valley, passing all of Dovedale’s most famous features. lining the horizon above the valley. .. You have a choice of routes to return to your starting point. 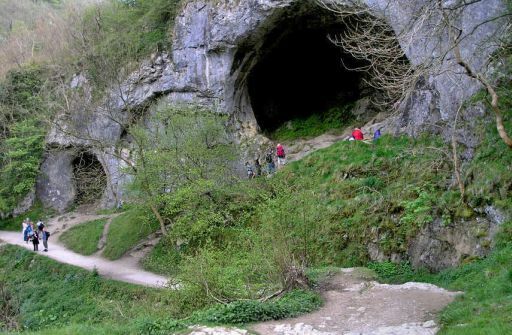 • Owned by the National Trust, Dovedale is known for its wooded gorge. 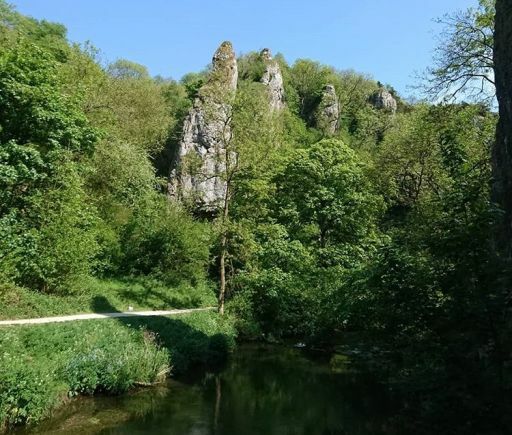 • Soaring pinnacles in Dovedale. ... can be created by the differential erosion of reef limestone. .. Ice Age glaciers 10,000 years ago. • England Mitte (Rother Wanderführer) , Tour 32 . 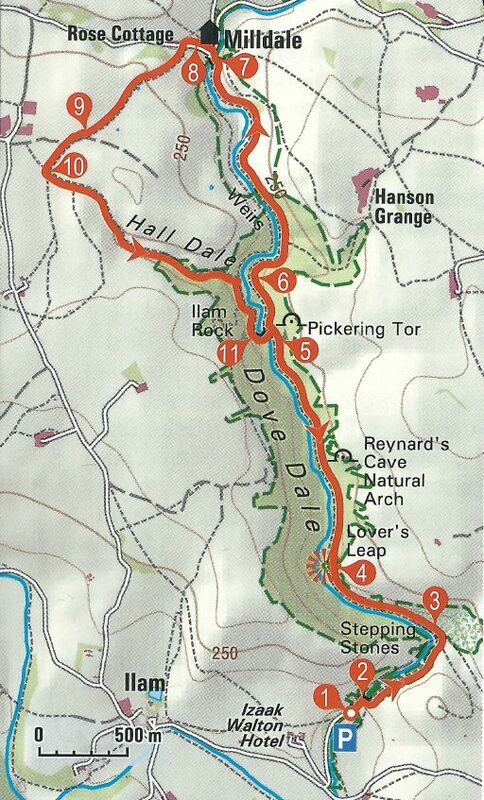 Dovedale und Halldale. there are sheep and dairy farms and some beef cattle. There are also steep, grassy dales, which are often grazed. and fertilised) the meadows are rich in wild flowers. 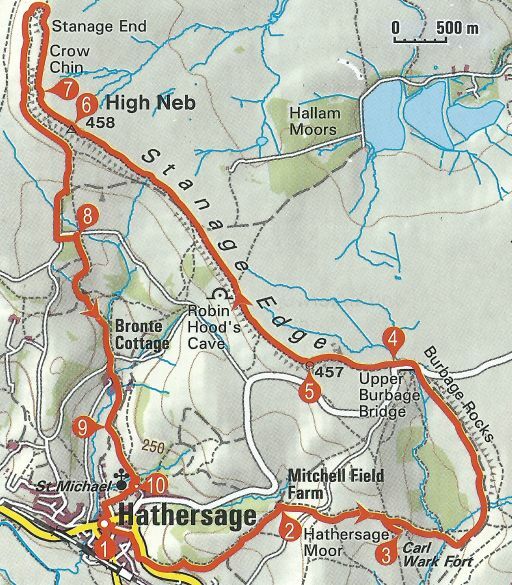 Stanage Edge – one of the most famous landmarks in the Peak District National Park. 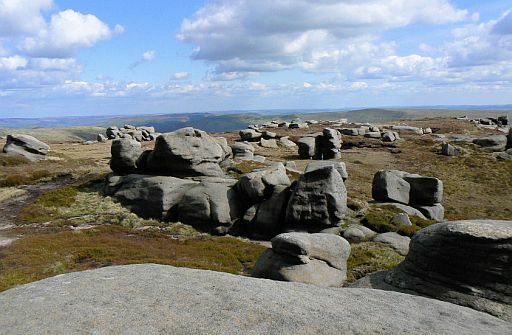 Stanage is one of the top climbing and bouldering locations in Britain. Edge for panoramic views. ( Edge is de streeknaam voor klif). the escarpment so you don’t topple off! 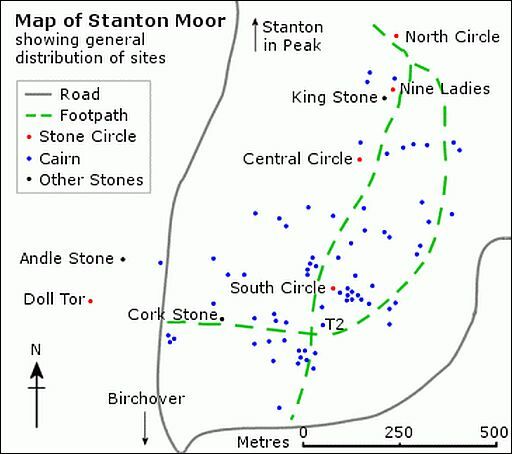 Gritstone = A coarse-grained sandstone. ............ a cliff of limestone on the side of a hill or steep valley. Dip slope .... = flauwe helling. ..................... = the very steep side of the escarpment (hier een klif). 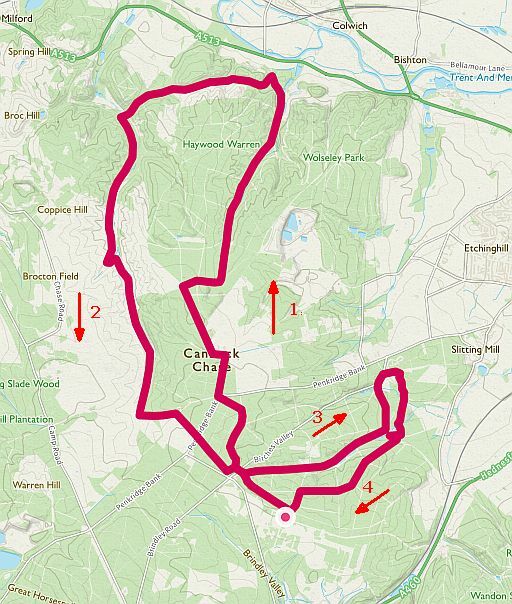 • Start / finish: Hollin Bank car park. 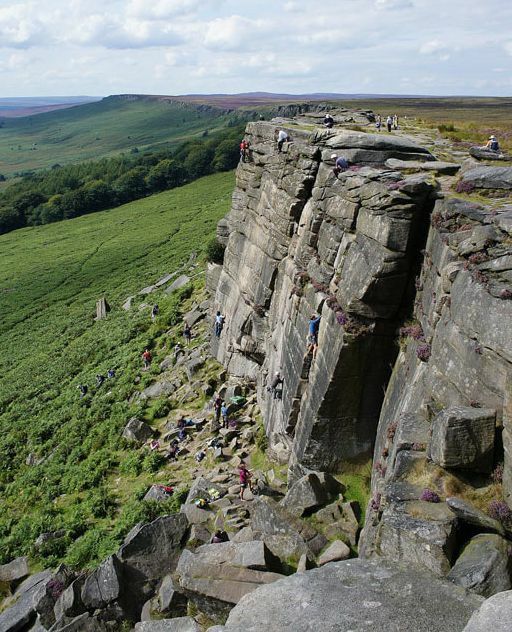 • There are lots of climbers on this part of Stanage Edge (Edge is streeknaam voor klif ). • Deze Edge is een lange klif met een puinhelling aan de voet. .. Op deze foto tot aan de horizon. • De heide rechtsboven is duidelijk upland (= land above the limit of enclosed farmland). • Millstones below Stanage Edge. .. facturing was one of the High Peak's major industries. .. wind power) to grind corn. .. they were left at the time of the industry's callapse. .................................................Totale stijging = 440 m ..
...... ( upland = land lying above the limit of enclosed farmland ). • England Mitte (Rother Wanderführer) , Tour 41 Stanage Edge (457m). with dramatic views across the Severn Plain. that divide the beautiful countryside of Worcestershire and Herefordshire. 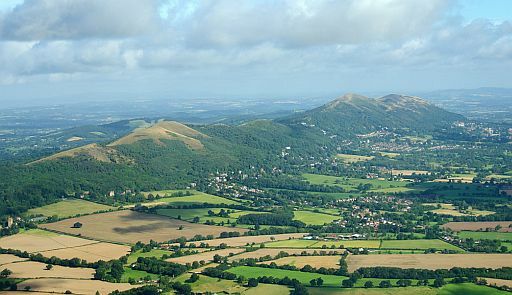 Victorian spa town of Malvern and Tenbury Wells. rock, and schist form these hills. to this granite-like rock with banding of different crystals. types of crystals begin to grow. 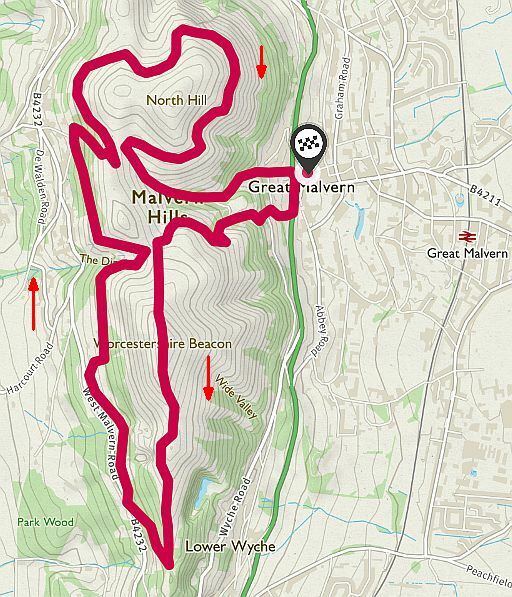 • Start / finish: Great Malvern. 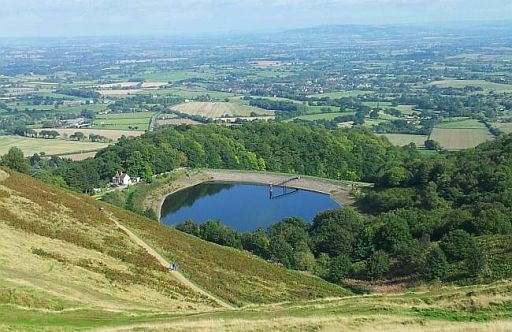 • Severn Trent's reservoir on the slopes of the Herefordshire Beacon. 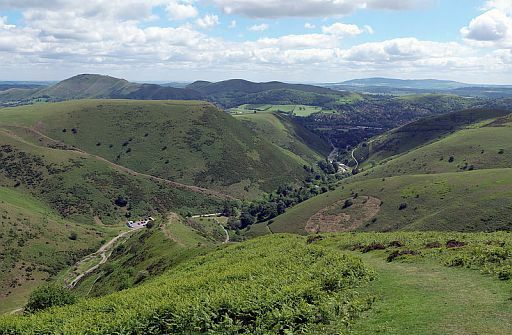 Carding Mill Valley and climbs to the rolling plateau of The Long Mynd. impressive cascades of the Lightspout Waterfall. with magical views across the Shropshire Hills. 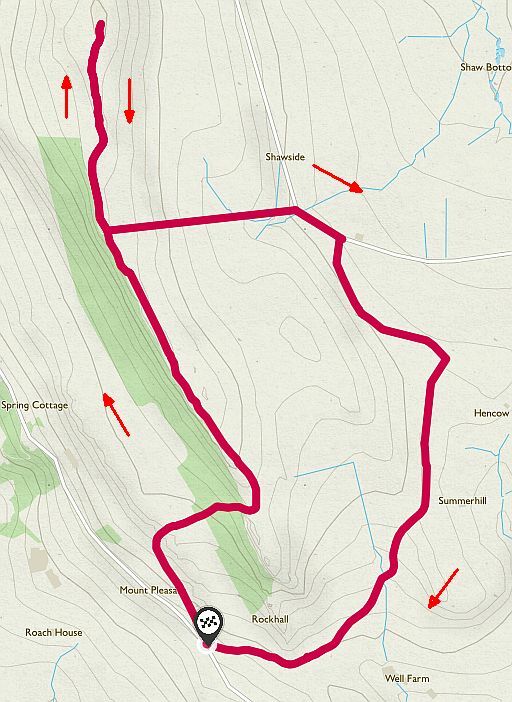 The Long Mynd plateau before heading back to your start point. most beautiful and underrated landscapes. 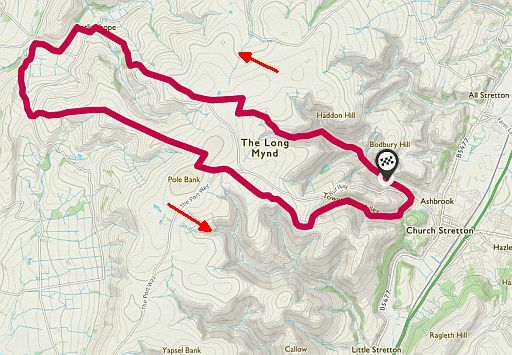 • Long Mynd means 'Long Mountain'. 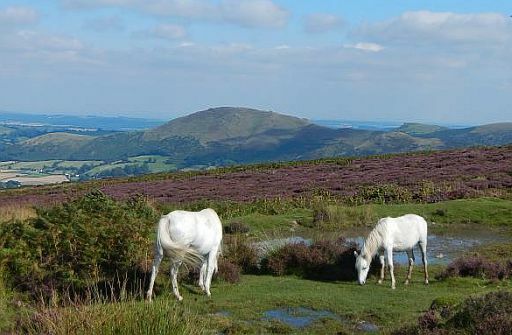 • This heath and moorland plateau forms part of the Shropshire Hills. • It is approximately 11 km long by a maximum of 5 km wide. .. the wide valley of the River East Onny. .. named hollows and batches. 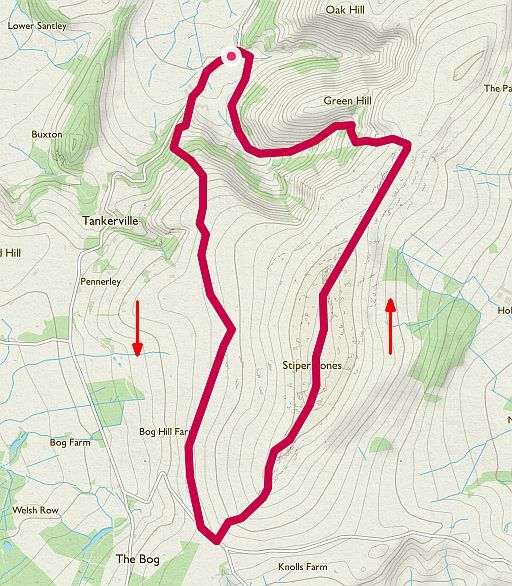 .. Long Mynd, near Church Stretton town. .. dales and. brooks to distinguish them from the larger features. 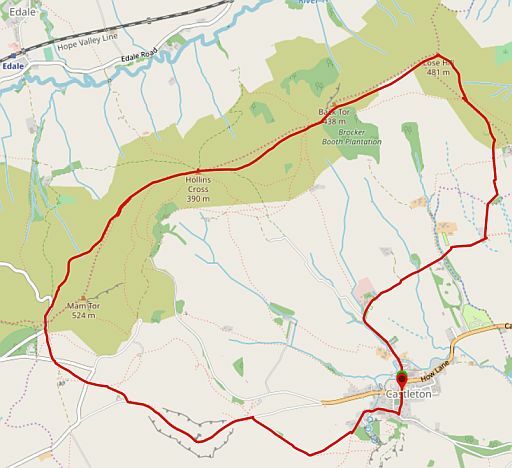 • Start / finish: Church Stretton. • Maps : OS Explorer 217 , 216 , 241. 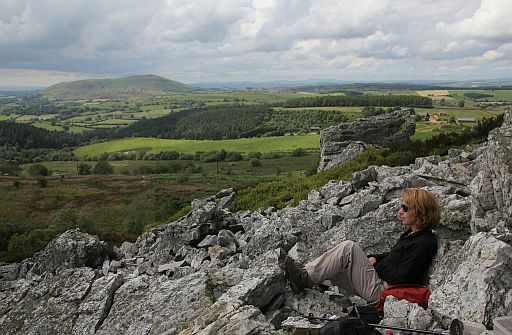 • The view near Pole Bank (516 m). • Typisch upland. ( = land lying above the limit of enclosed farmland). ...................... Het plateau heeft duidelijk het karakter van upland..
.............................. (= land above the limit of enclosed farmland). 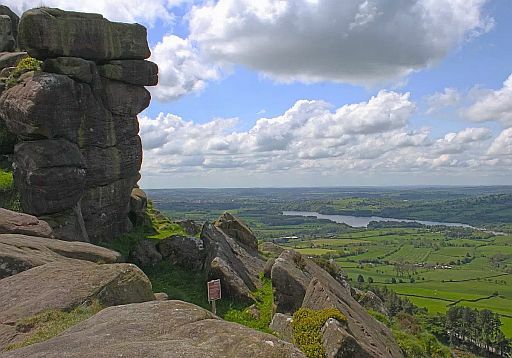 This short circular walk explores the spectacular gritstone ridge of the Roaches in the Peak District National Park. A special creature you may find in the Roaches is a wallaby. During World War II five wallabies escaped in the area and established a breeding colony of 50 around The Roaches. Sightings these days are rare, but still recorded. 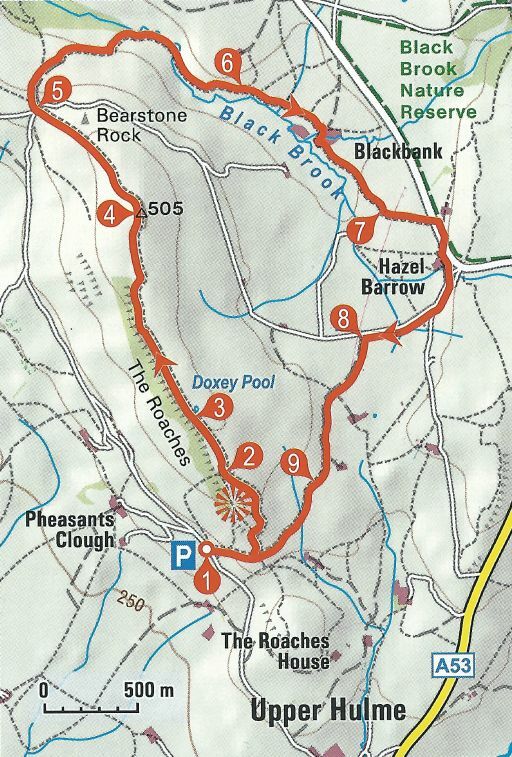 longer walk, it’s easy to see why The Roaches are so popular. • A great view down the gritstone edge (= klif) to Tittesworth Reservoir. ..............................(= land lying above the limit of enclosed farmland). • England Mitte (Rother Wanderführer) , Tour 35 . 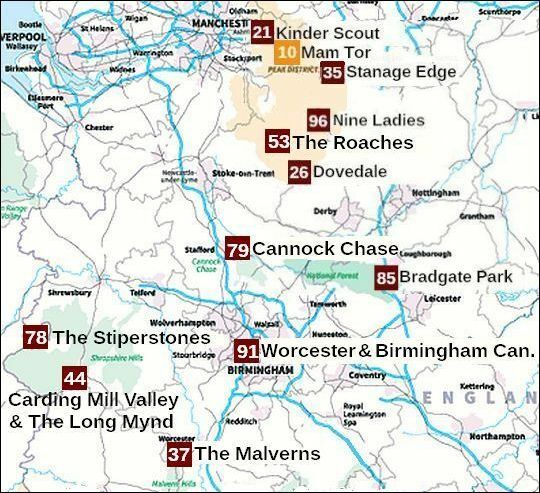 The Roaches. 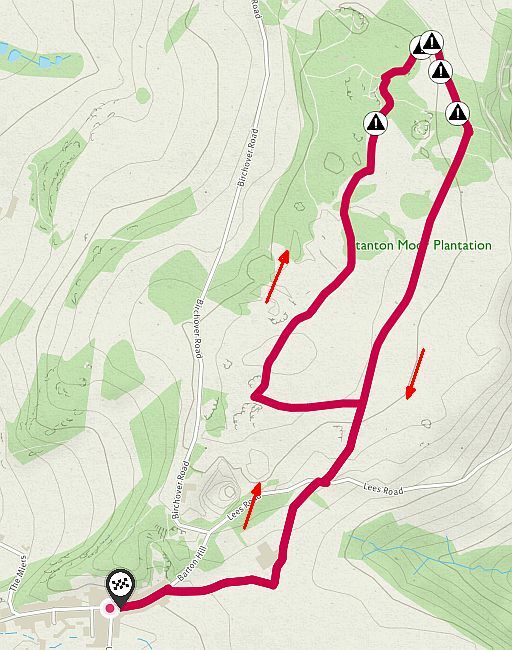 Hills – just hope you don’t bump into Wild Edric and the witches! The quartzite ridge rises sharply from the moorland surrounding it, which comes alive in a purple blaze of heather and bilberries in summer. with a small hooked beak. under the spell of its fascinating geology. process of freezing and thawing until they assumed their distinctive and brooding formations. 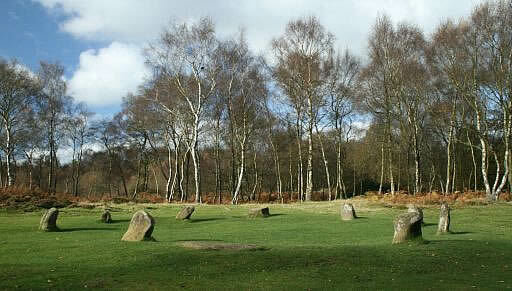 There are 6 distinctive rocky outcrops each with its’ own name. 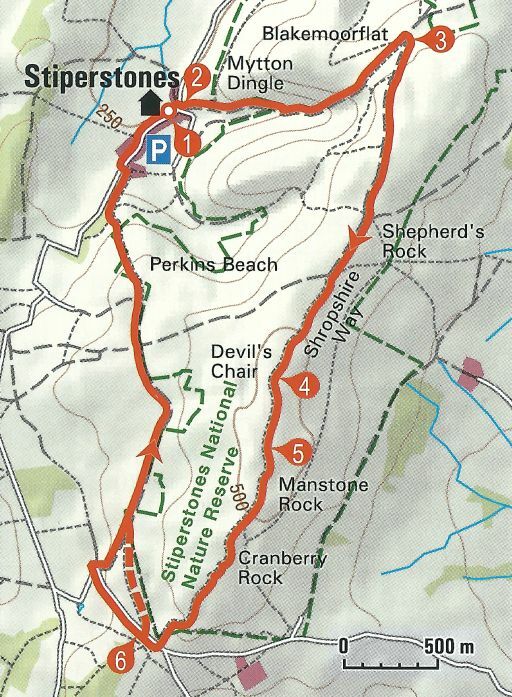 The most famous of these “Stiperstones” outcrops is the Devil’s Chair. you through the natural habitat for the world’s fastest animal, the mighty Peregrine falcon. is bekroond met harde, witte rotsformaties van zandsteen. Het meest bekend is de Devil's Chair. zegt men dat de duivel op z'n troon zit. Vanaf de Devil's Chair heb je mooie vergezichten. • The devil's Chair, a knife-edge of rock. • England Mitte (Rother Wanderführer) , Tour 15. 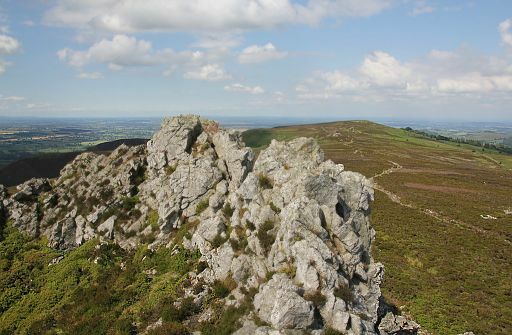 The Stiperstones (536 m). because of it’s beautiful landscape, history and wildlife. mixture of woodlands and open heathland. • Stepping stones across the Sher Brook in Sherbrook Valley. 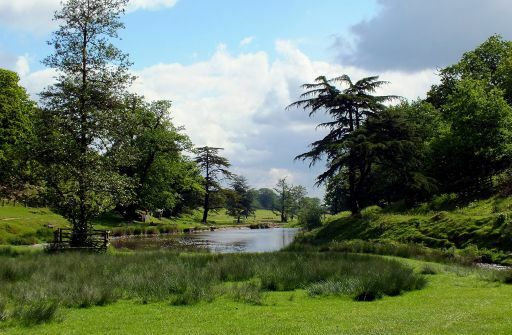 This park was first enclosed as a park around 800 years ago. When you visit look out for the 400 deer that roam free through the park. .. in all of England. .. 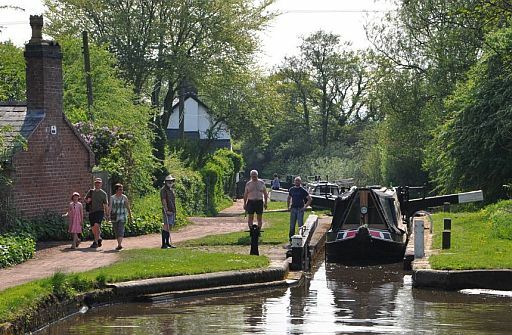 The 30 locks at Tardebigge ascend to 150 m above sea level. .. The five tunnels on the stretch make further locks impossible. 'Bill Stumps', is also mentioned in Dickens' Pickwick Papers. 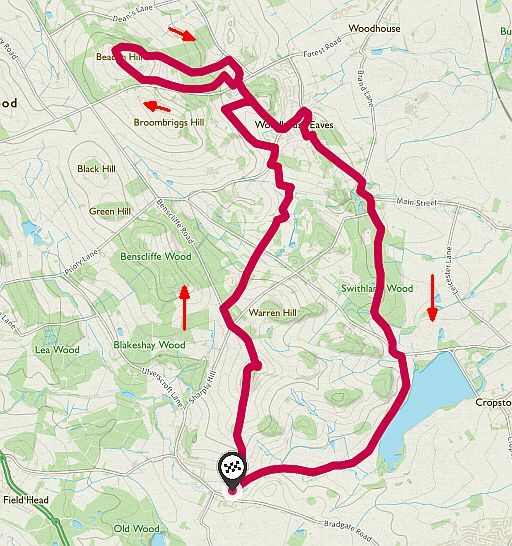 ........ De route blijft grotendeels rond 1,000 feet hoogte.